We will discuss an addiction that is rising at alarming rates not only among adults, but even more seriously, among children. The fact that this particular addiction is affecting our youngest and most vulnerable citizens makes this addiction a greater epidemic, perhaps, than all of the other addictions combined. 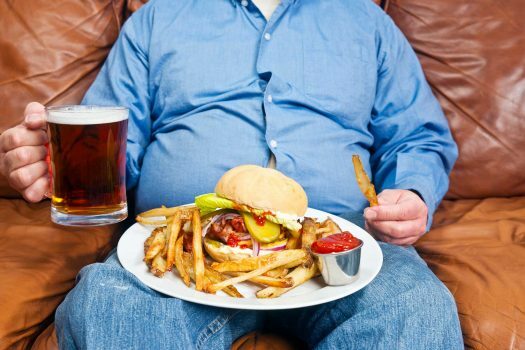 The addiction is obesity due to overeating. In order to tackle this particularly dangerous addiction, we must first understand the difference between being a little overweight and being obese. To be overweight is to carry a few extra pounds beyond what is considered normal and healthy for one’s height. Obesity is having too much body fat to the extent that it poses serious health risks that can lead to major illnesses or even death. To be fair, some obese people suffer from biological or hormonal problems that may contribute to their obesity. But for the most part, people are obese because they simply eat too much food. The World Health Organization (WHO) has predicted that obesity will soon replace poor nutrition and infectious diseases as the number one threat to public health. Obesity contributes to serious illnesses such as heart disease, diabetes and high blood pressure. Sadly, even our children are not immune to the ravages of overeating. It is estimated that 1 in 3 children are either overweight or obese. Parents, living in denial, rationalize feeding their children more food than they need by convincing themselves that their child’s weight is okay or as long as their child is healthy, what’s wrong with a few extra pounds that the child may outgrow. Unfortunately, this line of reasoning is refuted by statistics that show obese children, more often than not, grow up to be obese adults, many of whom die prematurely from illnesses brought on by the obesity. Like children, 1 in 3 adults are believed to be obese. They make as many excuses for themselves as they do for their children. Obese adults rationalize that their problem could be worse, while they reach for a second or third helping of food. So, how do we tackle to the ever increasing problem of obesity? The same as we tackle any addiction: acknowledge the problem, firmly resolve to seek out help such as Overeaters Anonymous, diligently follow the 12-step program which helps us to admit that we are too weak to overcome the addiction on our own and trust in God to help us overcome the addiction by His love and grace. A recommended book that may be helpful for people suffering from addiction to food is Steps of Transformation by Archimandrite Meletios Webber. While primarily written for alcoholics, this book can provide great insight for over-eaters as well. The solution for any addiction is the pursuit of Christ through stillness, diminishing denial and having complete transparency with at least one other human, inside and outside confession. Joining a 12-step program should also be a part of the recovery process. Christ is everything and we find Him in reality, not in escaping reality as it is.